The region east of San Francisco known as the East Bay is under mandatory water rationing. Yesterday we got a document from the water authorities laying out our consumption patterns over the past three years, and ordering us to reduce our consumption by 19 percent from that baseline amount. If we don't, we'll be fined $18 a day, which over a 60-day billing period comes out to $1,080, or $6,480 a year. And that would be on top of the 10 percent rate hike that's already been put in place for everyone, whether they conserve or not. So I think twice when I lean over to flush the toilet. I don't languish in the shower. Our car is filthy. If your local reservoirs are full, be thankful. According to reporting by the Christian Science Monitor, the Coast Guard focuses almost exclusively on 9/11-related security responsibilities and has all but abandoned its traditional duties. That's why it was so slow to respond to this month's San Francisco Bay oil spill. The City of San Francisco offered the Coast Guard a fireboat the morning of the spill but the CG refused it. The CG long ceased training local civilian fleets how to contain an oil spill in its early stages. Only a fifth of the 58,000 gallons was contained before polluting San Francisco Bay. Today the San Francisco Chronicle reports that sea birds are still washing ashore covered in oil, and that perhaps 20,000 birds have died so far. China imported 18.7% more crude oil in August than during the corresponding month of last year, data from the General Administration of Customs showed. August imports totaled 14.04 million metric tons, equivalent to 3.32 million barrels a day, the customs data showed. China is the world's second-largest energy consumer behind the U.S. The real oil crisis is yet to come. Enjoy that SUV while you can. 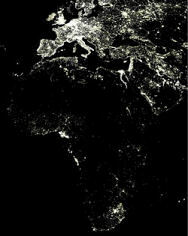 Africa is home to one-sixth of the Earth's population but generates only four percent of its electricity. The Economist reported last month on the continent's powerlessness, in every sense of the word. I love thunderstorms, but not when they knock out power for eight hours. You know how it is: the blinding flash, the deafening crack, then darkness. Gone was the Weather Channel radar, at the time showing yellow and red. Gone was my MFS flight from Hana, safely up over the 8,000-foot Maui mountains over to Molokai. Power soon returned to every building in the complex but mine. First I lied down on the couch and just daydreamed. After 30 minutes of that I found a flashlight and read some issues of PR Week and Mass High Tech. Don't ever say print is dead. That soon got old, so I fired up some candles and my iPod and listened to podcasts: the Dan and David Show from ZDNet, and the weekly one from The Economist. It was Saturday night, after all, so I thought I'd live it up. Congrats to the New York Times for today's chilling article about drought and pollution in China. The bigger takeaway, for me at least, was how little control Beijing has over the provinces. Imagine if U.S. state governments struck their own deals with corporations to build dams, factories, bridges or whatever, flouting Federal laws in the process or bribing enforcers into silence. That's what's going on in China. That China is polluted isn't news. But things clearly are spinning out of control and, paradoxically, no one seems to be in charge in the world's largest police state. This Jun. 17 article on ZNet shows that the U.S. military frets about its own future access to oil. Never mind people like you and me: in 2007 the U.S military alone will consume the equivalent of 14 million gallons of oil per day. That's 1.3 billion gallons a year, more than the annual oil consumption of Bangladesh. This report is long but official: it's called "Transforming the Way DoD Looks at Energy." And the way the Department of Defense sees it, "current planning presents a situation in which the aggregate operational capability of the force may be unsustainable in the long term." So we ain't leavin' Iraq even when we leave, and as Seymour Hersh long has said, Iran is next. Thanks to Linda Whitmore-Smithers for the pointer. Anyone interested in Middle East affairs needs to read DEBKAfile. Here's DEBKAfile's background. Published from Jerusalem, DEBKAfile has unearthed prescient info for seven years now. Want an example? Check out last weekend's piece on Cheney's visit to Saudi Arabia. Did you know the US is planning to leave Iraq and that Saudi Arabia will get our best planes to help police the region? Why isn't this being widely reported? "We start where the media stop" is truly a fitting slogan. Spend some time on DEBKAfile and be informed. I can see the headlines now. He'll suffer the same fate as Allende, who also disenfranchised the multinationals. You don't piss off the power and get away with it. If you start seeing CNOOC officials in the hotel lobbies of Caracas, it's a matter of time.